But the truth is that I learned an enormous amount from all three of them – not from what they said but from what they did, as teachers and writers. From Morison, especially from his vast 15-volume history of the US Navy in WW II, and also from his multi-volume history of Harvard, I learned that it is possible to write a complex story crowded with detailed incidents and conflicting personalities in clear, simple narrative form. From Buck I learned that one can best motivate students by getting them to elicit what truly interested them, to get them to recognize what – for whatever reason – caught their imagination, and encourage them to work out from there. And from Handlin I learned the most important thing of all, that history is a form of intellection, a way of thinking and understanding, not a compilation of facts, no matter how cleverly you organize them. So I was lucky, not in having wonderful advice given to me but in witnessing up close some master historians at work. It’s what they did that mattered, not what they said. I can’t think of a better way to inaugurate this series of lectures than with one on the founding of our republic, also the first White House cyberspace lecture. We are truly imagining — honoring the past, not by imagining the future, but through the prism of the future. I thank Bernard Bailyn for what he said and the way he said it and for a lifetime of work. We received the distilled wisdom tonight of more than four decades of hard thinking and work about what it means to be an American and what America means to Americans and to the rest of the world. Teaching Positions: Harvard University, Cambridge, MA, joined faculty in 1949, instructor in education, 1953-54, assistant professor, 1954-58, associate professor, 1958-61, professor of history, 1961-66, Winthrop Professor of History, 1966-81, Adams University Professor, 1981-93, James Duncan Phillips Professor of Early American History, 1991-93, professor emeritus, 1993–, director of Charles Warren Center for Studies in American History, 1983-94. Education: A.B., Williams College 1945, A.M. (1947), and Ph.D. (1953) Harvard University. The New England Merchants in the Seventeenth Century,(Harvard University Press, 1955). (With wife, Lotte Bailyn) Massachusetts Shipping, 1697-1714: A Statistical Study, (Belknap Press of Harvard University Press, 1959). Education in the Forming of American Society: Needs and Opportunities for Study, (University of North Carolina Press, 1960). The Origins of American Politics, (Knopf, 1968). The Ordeal of Thomas Hutchinson, (Belknap Press of Harvard University Press, 1974). History and the Creative Imagination, (Washington University, 1985). The Peopling of British North America: An Introduction, (Knopf, 1986). Voyagers to the West: A Passage in the Peopling of America on the Eve of the Revolution, (Knopf, 1986). Faces of Revolution: Personalities and Themes in the Struggle for American Independence, (Knopf, 1990). The Great Republic: Nineteenth and Early Twentieth-Century America, 1820-1920, (D. C. Heath, 1993). On the Teaching and Writing of History: Responses to a Series of Questions, edited by Edward Connery Lathem, (Montgomery Endowment, 1994). The Federalist Papers (Bradley Lecture Series Publication), Library of Congress, 1998. To Begin the World Anew: The Genius and Ambiguities of the American Founders, Knopf, 2003). (Editor, with Jane N. Garrett, and author of introduction) Pamphlets of the American Revolution, 1750-1776, Volume 1, Belknap Press of Harvard University Press (Cambridge, MA), 1965. (Editor) The Apologia of Robert Keayne: The Self-Portrait of a Puritan Merchant, Harper & Row (New York, NY), 1965. (Editor, with Donald Fleming) The Intellectual Migration: Europe and America, 1930-1960, Belknap Press of Harvard University Press (Cambridge, MA), 1969. (Editor, with Donald Fleming) Law in American History, Little, Brown (Boston, MA), 1972. (With others) The Great Republic: A History of the American People, (Heath, 1977, 4th edition, 1992). (Editor, with John B. Hench) The Press and the American Revolution, (American Antiquarian Society, 1980). (Editor, with Philip D. Morgan) Strangers within the Realm: Cultural Margins of the First British Empire, (University of North Carolina Press, 1991). (Editor) The Debate on the Constitution: Federalist and Antifederalist Speeches, Articles, and Letters during the Struggle over Ratification, two volumes, (Library of America, 1993). From Protestant Peasants to Jewish Intellectuals: The Germans in the Peopling of America (published together with Causes and Consequences of the German Catastrophe, by Heinrich August Winkler), (Berg for the German Historical Institute, 1988). Editor-in-chief, “John Harvard Library,” 1962-70. Editor with Donald Fleming, Perspectives in American History,annual of Charles Warren Center for Studies in American History, Harvard University, 1967-77, 1984-86. Contributor to symposia and proceedings of professional organizations. Contributor to professional journals, including American Historical Review and William and Mary Quarterly. Contributor to books including A Lyme Miscellany, 1776-1976,edited by George J. Willauer, Jr., (Wesleyan University, 1977); and Glimpses of the Harvard Past, (Harvard University Press, 1986). Pulitzer Prizes in history, 1967, for The Ideological Origins of the American Revolution, and 1986, for Voyagers to the West: A Passage in the Peopling of America on the Eve of the Revolution. Bancroft Prize, Columbia University, 1967, for The Ideological Origins of the American Revolution. National Book Award in history, 1975, for The Ordeal of Thomas Hutchinson. Saloutos Award, Immigration History Society, 1986, Triennial Book Award, and nomination for National Book Critics Circle Award, 1986, all for Voyagers to the West. Kennedy Medal of the Massachusetts Historical Society, 2004. Centennial Medal of the Harvard Graduate School of Arts and Sciences, 2001. Bruce Catton Prize of the Society of American Historians for lifetime achievement in the writing of history, 2000. Medal of the Foreign Policy Association, 1998. Henry Allen Moe Prize, American Philosophical Society, 1994. Thomas Jefferson Medal of the American Philosophical Society, 1993. Fellow, British Academy, and Christ’s College, Cambridge University, and Montgomery fellow, Dartmouth College, 1991. L.H.D., Lawrence University, 1967, Bard College, 1968, Clark University, 1975, Yale University, 1976, Grinnell College, 1979, Trinity College, 1984, Manhattanville College, 1991, Dartmouth College, 1991, University of Chicago, 1991, and William and Mary College, 1994. Litt.D., Williams College, 1969, Rutgers University, 1976, Fordham University, 1976, and Washington University (St. Louis, MO), 1988. Recipient of first Robert H. Lord Award, Emmanuel College, 1967. Harvard Faculty Prize, 1965, for Volume 1 of Pamphlets of the American Revolution. Additional Info: During World War II Bailyn served in the Army Signal Corps and in the Army Security Agency. 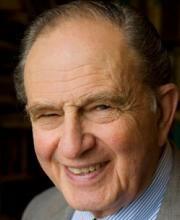 Professor Bailyn is a member of the American Historical Association and served as President in 1981. He is also a member of the American Academy of Arts and Sciences, the American Philosophical Society, and the National Academy of Education. He is a Corresponding Fellow of the British Academy and the Royal Historical Society, and a Foreign Member of the Russian Academy of Sciences, the Academia Europaea, and the Mexican Academy of History and Geography. He was a Trustee of the Institute of Advanced Study, Princeton, 1989-94. Bailyn was the Jefferson Lecturer, National Endowment for the Humanities, 1998, and the first millennium lecturer, White House, 1998. He also serves as a Senior Fellow in the Society of Fellows. Bailyn is Director of the Harvard’s International Seminar on the History of the Atlantic World since 1995.